Lillian Collier: The Mysterious Flapper – new data! I’ve written quite a lot about Lillian Collier of the Wind Blew Inn, a flapper who was sentenced to read a book of fairy tales to cure her bohemianism in 1922. A few years later she appeared in a widely-circulated article saying that flappers were not “savages,” but represented a new era of freedom for women. After that, she vanished from the record. Several Lillian Colliers were found – a suffragist in Texas, a poet in Canada, a New York socialist – but none I could trace positively to her. Today I was digging through the Herald Examiner archives, having heard that she worked as a reporter from them in 1920 under the name “Our Little Girl Reporter,” a title that several reporters held at that paper (most notably Carol Frink, whose husband wrote The Front Page with Ben Hecht). I could only find one article I could trace to her – a story about painting the words “Safety First” on the 10th story of a building on Van Buren (wonder if it’s still there?). However, Herald Examiner notes from when her Bohemian tea room, The Wind Blew Inn, was raided by the cops turned up two very interesting new pieces of info that may just help solve this mystery. 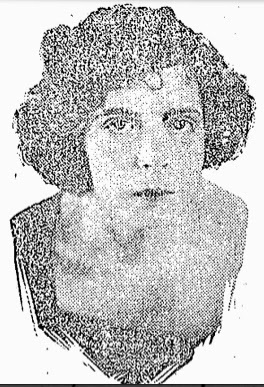 One is that Virginia Harrison, described as Collier’s “aid” in some papers, appears to have given her name as Virginia Collier. This may be a clue that the two were “more than friends,” as some have surmised. It could also just be a mistake, though. – Lillian was born Lillian Lieberman around 1901-2 in New York. – She apparently married one Herbert Collie in New York in 1919; the name was usually spelled “Collier” in the press, though records stick with “Collie.” It may have been an affectation on her part. I found a record of the wedding, but can’t definitively, 100% match it to THIS Lillian Lieberman. – By spring of 1920, she was living with her parens, Meyer Lieberman and Nellie Lieberman, in Chicago near North and Leavitt, as well as her sisters, Martha Lieberman and Bertha Lieberman. Herbert was out of the picture by this time, but she kept his name. – I can’t find much about Herbert Collie. I did find a thing saying Martha, her sister, died in 1991 and had been a vaudeville dancer at one point. – Meyer and Nellie were apparently divorced in 1921. So, that maiden name is a STRONG new clue, and one that might very well help us find out what happened to her after 1925. On Wednesday, we’ll feature a newly-discovered essay written by her mother in 1912! How fascinating! This is seriously one of my favorite blogs. Thanks so much for all the hard and interesting work that yuo do. The Flapper’s Mother: Feminism in 1912?